This happy little chef bear has just prepared a cute cupcake for you! 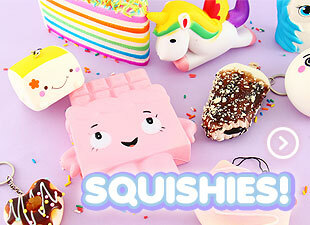 The squishy is a purple bear with a chef's hat on its head, two cupcakes, and hearts in its eyes. It is super soft, slightly scented and made of semi-slow rising material. Use this cutie squishy as a decoration, for cuddling and stress relief or just for fun & games!